This Asian Cabbage Salad is absolutely addictive! Greens and shredded cabbage are tossed in a magical cabbage salad dressing that is sweet, spicy, sour, and a bit salty. 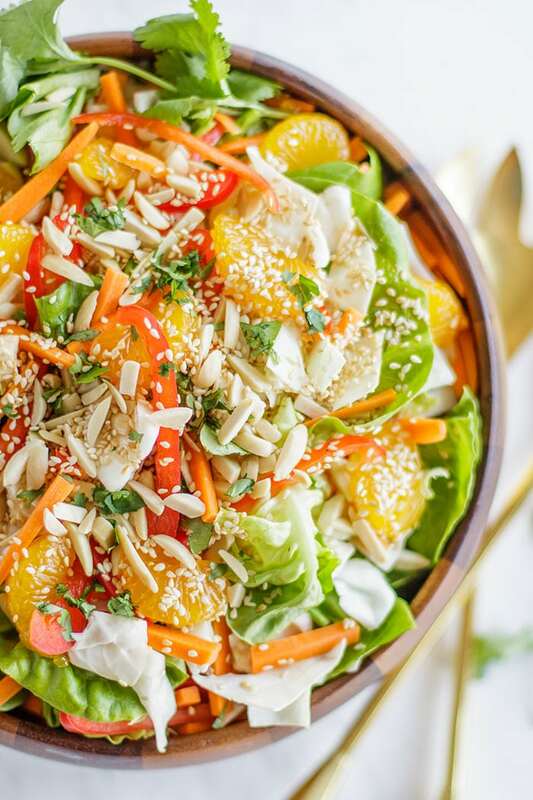 Oranges, fresh veggies, and crunchy toasted almonds take this easy Asian cabbage slaw over the top! The perfect compliment to grilled meats at a summer BBQ. *This post was originally published in June 2014, but has been updated with new photos and enhanced recipe instructions. Additive only begins to describe this easy cabbage salad recipe! I’ve been making this Asian Cabbage Salad for much longer than I’ve been blogging. It’s something I love to serve for guests, compliments BBQs so well, and also is perfect for meal prep. 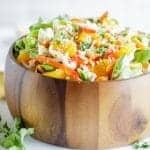 The cabbage and carrots in this recipe soak in the dressing, making this salad even better after sitting in the fridge for a few days. If you’re looking for the perfect compliment to this delicious salad, try my Ginger Sesame Chicken Skewers, or my easy Quinoa Asparagus Tom Kha Gai. What really makes this cabbage salad amazing is the rice wine vinegar dressing! If you’ve never used rice wine vinegar in salad dressings, it’s what gives this recipe a really authentic Asian flavor. Asian soups and dressings are so addictive because of the melding of flavors — spicy, sweet, sour, and salty. This dressing combines all of those flavor profiles! It’s only 5 ingredients, just add to a jar and shake. 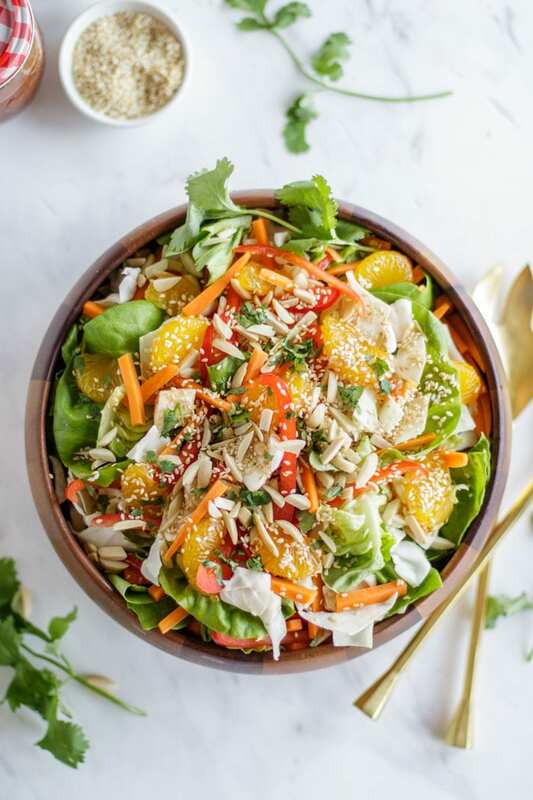 The Asian cabbage salad dressing gets warmth from the sesame oil, acidity from rice wine vinegar, then just add some salt, some honey, and a spicy chili sauce to bring it together. Since you’re making it at home, you can add more sweetness, or make it more or less spicy depending on your preference. We love it with a pretty spicy kick! While I love to serve this alongside grilled meats, it’s a light meal on it’s own thanks to the toasted almonds and sesame seeds on top. If I’m eating this for lunch and not adding chicken, I like to add quinoa or extra almonds to boost the protein. When I serve this healthy salad, there is never anything left in the bowl! It’s something I always make when I want to add more greens to my diet but feel myself needing motivation. This salad is something I literally eat for “dessert.” I crave all the flavors and the crunch from the nuts. I love making this salad on a Sunday and eating it for days. When I do this, I either omit the lettuce & peppers, or I store them separately. The cabbage and carrots soak in the dressing, and it just gets better and better each day. Make this Ahead: Add the dressing to the cabbage, carrots and oranges, and store separately. Either keep the lettuce and peppers in a separate container (they will get soggy if left soaking in the dressing), or just omit them for a meal prep option. Keep the toasted almonds and sesame seeds in a separate container also, and add when ready to serve! Make it a Meal: I love to pack this salad on a bed of quinoa for the perfect lunch. It would also be great with rice or another grain. To keep things low carb, just add chicken or grilled steak. This easy asian cabbage slaw is absolutely addictive! The perfect recipe to serve alongside grilled meats, but also a great meal prep option. The magic of this salad is the sweet-spicy-sour-salty dressing. 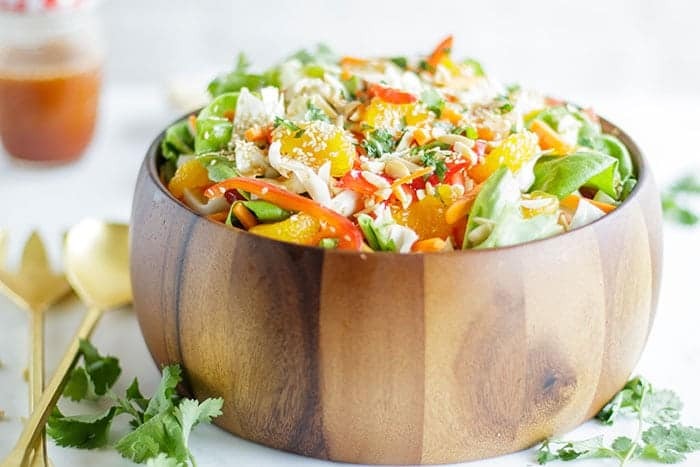 1-2 teaspoons sriracha or other chili sauceAfter chopping the veggies, add the cabbage, carrots, and mandarin oranges to a bowl or storage container. After chopping the veggies, add the cabbage, carrots, and mandarin oranges to a bowl or storage container. Wow, this is my kind of salad. Loaded with great ingredients and big flavors. I too love making a couple of salads that will last a few days to take to work. It really makes getting ready in the morning so much easier. Yes-- I love the big flavors in salads. I don't think you can make it through a week of lunches without having something prepped to get you through! Gorgeous photos, but most importantly, amazing recipes! This looks scrumptious. Thank you! It's one of my favorites-- I've been making this salad for years and it just doesn't get old. 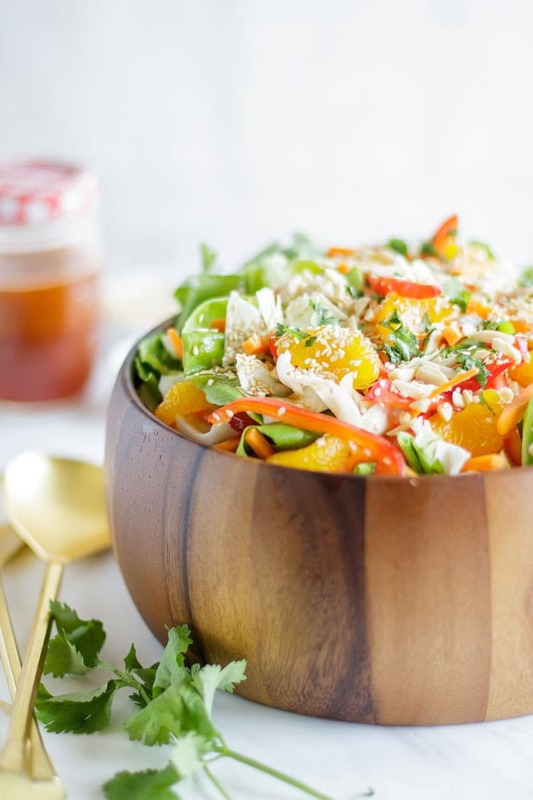 im always looking for new salad ideas to make during the week, thanks for sharing this asian salad. it looks delicious & i definitely will be making it! Beautiful salad, Michelle! I love the addition of sriracha to the dressing. So looking forward to warmer temps and eating fresh foods outside! Gorgeous shots, too. Wonderful salad. So fresh and beautiful. Dropping by to say thank you for sharing this recipe. I would have to agree that it is addictive. Light yet fulfilling. This Asian cabbage salad is one of my personal favorites. Thank you Sheila! What a nice comment. It is a go-to around here because everyone loves it. I friggin' ADORE cabbage - ADORE IT - sadly... IT DOES NOT adore me< LOL! Oh Gigi, I feel your pain! I am allergic to a lot of foods that I adore too... Cabbage would be a terrible one though! Veggies! Oh, how I love veggies! I just LOVE the taste of sesame oil! This Asian Cabbage salad recipe is just what I was looking for! I adore sesame oil too -- I always use a lot of it when I make Asian inspired dishes! Made this last night and it was such a hit. The dressing is soooo good with the sriracha and sesame oil. We all loved the mandarins too. Thanks for telling me! I adore this salad and keep that dressing on hand -- addictive! Michelle, thank you! Wonderfull salad! I made it last night and they were easy and absolutely delicious! I adore this salad! Thanks for letting me know, Anna!